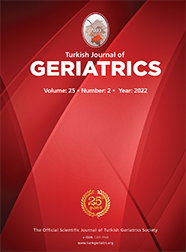 Etlik İhtisas Hastanesi, Anestezi-Reanimasyon ANKARA Introduction: The study aimed to determine the causes of peroperative complications occurred among geriatric patients exposed to general anesthesia. Materials and Method: Records of geriatric patients who were operated in our clinic during the last year were reviewed retrospectively. Data of the patients were recorded on multi-variate complication forms. Complications arising during peroperatory period in the patients were identified. The causes of the complications as well as the most likely systems to which they were related, physical evaluation scores of American Anestheological Society, and complication status in accordance with the inhalation agents were taken into account. The time and causes of cardiac arrests were also evaluated. Results: The number of geriatric patients subjected to general anesthesia was found to be 1960. On evaluation of these patients 284 cardiovascular, 25 gastrointestinal, 12 respiratory, 2 neurological and 13 others - totally 336 complications were identified. Three of them developed peroperative cardiac arrest, but none of them died. According to the physical evaluation scores of American Anesthesiology Society, the rates of the complications showed an increase from I to V (p<0.001). Among inhalation agents complication rates were least in the sevofluran group , (p<0.05). It was also observed that the risk of complication was more likely with the prolongation of the operation.